The end of 2015 and start of 2016 have been busy times for SIM Malawi, and this is reflected in this issue of Malawi Amoto. Sports Friends Malawi is breaking exciting new ground as it delivers training camps for football and netball with new church groups. We also hear about a netball coach who found Sports Friends Malawi to be the answer to concerns her parents had over her involvement in sports. 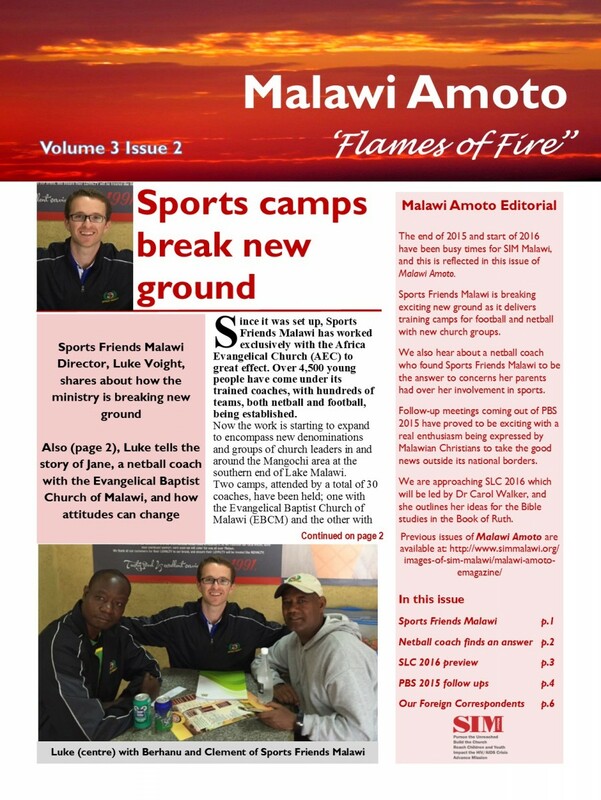 Follow-up meetings coming out of PBS 2015 have proved to be exciting with a real enthusiasm being expressed by Malawian Christians to take the good news outside its national borders. We are approaching SLC 2016 which will be led by Dr Carol Walker, and she outlines her ideas for the Bible studies in the Book of Ruth.